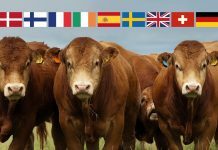 In 2011, the British Limousin Cattle Society joined forces with ABP (Anglo Beef Processors) and SRUC (Scotland’s Rural College (formerly SAC)) to embark on a ground-breaking four-year project exploring the use of the latest genetic and imaging technologies to improve carcase traits in Limousin cattle. It was a £1.5 million initiative, funded by the Government’s Technology Strategy Board (TSB). The aim of the project was to understand the influence of genetics on carcase traits, to establish reliable methods of recording data and produce breeding values that identify breeding animals with superior genetic merit for up to nine new carcase traits. To achieve this Video Imaging Analysis (VIA) results of carcases were combined with genomic information from DNA. This builds up a ‘SNP Key’ for the breed, which producers can compare their live animals’ DNA against and identify their breeding merit for the nine new traits. 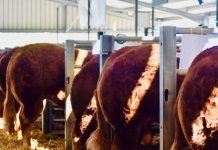 This is the first use of this exciting new technology in the beef sector in the UK and means breeding merit for a range of carcase cuts can be identified at a very early stage in an animal’s life, with a great degree of accuracy. As the research involved with this project progressed, snapshots of information were discovered that pointed towards the financial benefit from differentiation between individual animals and breeds. A snapshot of ‘all breed’ and Limousin VIA (Visual Image Analysis) records identified very quickly in the project that considerable variation for high value cuts exists between and within all breeds. The heritabilities of the various cuts were quickly established and were consistent with the findings in earlier research in this country and abroad. Given the research indicated that variation exists and that a trait is heritable, it became clear that it could be successfully selected for in breeding programmes. Being able to identify the animals in our UK population that have the genetics to produce 2kg more striploin and other high value cuts is extremely powerful knowledge for producers of Limousin cattle. 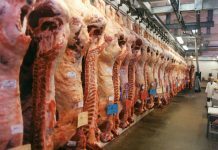 Furthermore, analysis of 20,000 steer carcases across all breeds revealed that animals within the same EUROP and Fat Classifications varied significantly in their eventual retail value. In the EUROP classification messages about carcase quality largely go unrewarded and are therefore lost up the breeding chain. A situation where producers of high-value carcases within a broad classification category receive the same payment as low value carcases is helpful to no sector within the supply chain. 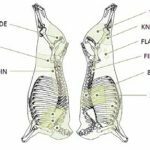 VIA (Visual Image Analysis) enables accurate assessment of each primal cut within the carcase and research has established it as a superior method of carcase classification when it comes to ranking true carcase worth. With ABP’s data flow into the project came the ability to produce some early Carcase Trait EBVs. 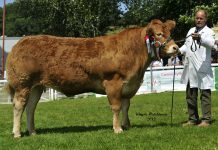 A sample of 30 Limousin sires with at least 10 slaughtered progeny was examined and the average price achieved by those calves was calculated. On average, the retail value of the calves sired by the bulls with the best Carcase Trait EBVs was £463/calf more than the calves sired by the bulls with the worst EBVs. This provided evidence that the breeding values would successfully identify better and poorer performing animals, and the degree to which industry will benefit from sharper selection decisions. Work on the project data continued through 2015 and the VIA measurements were blended with DNA information obtained from a wide cross section of the breed to provide the carcase trait Genomic Breeding Values. 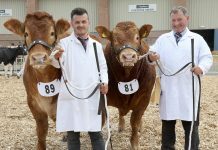 Subsequently, in a ground-breaking move for the UK beef industry Genomic Breeding Values (GEBVs) for the range of new carcase traits became available for all Limousin cattle in March 2016. Limousin breeders are now able to genotype their animals at birth and receive the GEBV for each of the nine VIA carcase traits. Identifying the high performers so early in life with greater degrees of accuracy than before will be incredibly valuable to breeders and commercial Limousin buyers when making their breeding and management decisions. For more information, contact Alison Glasgow BLCS Technical Manager on 02476 696500 or email alison@limousin.co.uk.